A little less than 5 hours left till the grand online shopping event at AyalaMoriel.com closes. All roll-on bottles are 50% off ($32.50 instead of $65 for the 5ml Purse Roll-On, and $65 instead of $130 for the 10ml Roll-On Bottles). Candles and teas are 20% off. Perfect timing to find the perfect gift for the women in your life for Mother's Day and stock up on your personal favourites. If you need any help choosing a scent, you can also fill out the questionnaire, email or call us. 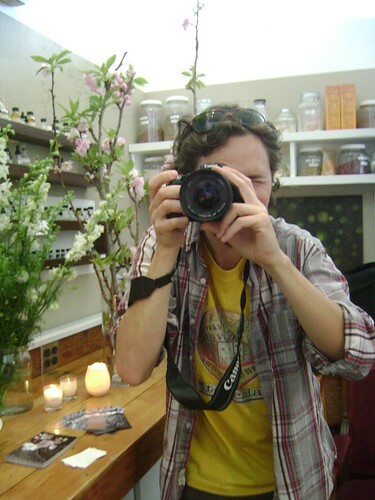 Read Denyse Beaulieu letter to Perfumer & Flavorist Magazine, addressing some of the burning issues of reformulation, regulation, perfume blogging and engaging the industry in what (we hope) perfume consumers care about. Ms. Beaulieu is a French-Canadian writer and perfume connoisseur living in Paris and the editor of Grain de Musc. She's known on Perfume of Life and other perfume forums as "carmencanada". To thank you for your continuous support of my little perfumery which in return enables me to support my own family doing what I truly love - I would like to extend my invitation to you to participate in my Grand Online Shopping Event April 30th, starting midnight. This is my way of thanking you and is a gesture to my devoted customers in these uncertain times, hoping that this will enable you to treat your mothers to something special this coming Mother’s Day. For 24 hours only on April 30th, all roll-on bottles will be offered for 50% off ($32.50 instead of $65 for the 5ml Purse Roll-On, and $65 instead of $130 for the 10ml Roll-On Bottles). Candles and teas will be 20% off. Don’t miss this opportunity to find the perfect gift for the women in your life, not to mention stock up on your favourite scents. The following is a suggested menu for a tea party centered around Charisma tea. This tea is refreshing, floral and very fragrant. It is important that whateer flavours accompany it do not overshadow its delicate aroma, but complement it. As a result, it makes for a very nice spring or summer tea party setting – where light tea treats such as citrus tarts and pastries and crunchy peppery sandwiches allows you to cool off and enjoy a cup of tea. Bring water to a boil. Rinse off the teapot and measure 1 tsp. for every 5oz of tea desired. Wait until water reaches 80 degrees Celsius (176F). Steep the tea for 2 minutes and remove leaves from the tea. A second brewing (and up to a total of 4 brewings) can be done by re-steeping the tea for a slightly shorter period (1.5 minutes) in the same water temperature. Plain scones*, served with Lemon Curd (homemade or store bought), Meyer Lemon Marmalade (or any other citrus marmalade to your liking), and Devonshire Cream. Apricot jam may be appropriate for this tea as well if you don’t like marmalades. * Keep the desserts light and airy. i.e. : dark chocolate desserts are not the best company for this tea. Citrus flavoured and flowery desserts are the best, and the lighter the texture the better. The following are my tried-and-true tea sandwiches recipes. These are the very same we served at the Blunda event and were gone in a blink of an eye - they are that good! Thankfully, they are also relatively easy to make, as long as you have all the ingredients and are not in a terrible rush. Mince 1 carrot or slice very thinly with a carrot peeler. To ½ cup of softened cream cheese add 1 Tbs. finely grated fresh ginger root. Spread both sides of thinly sliced bread with cream cheese mixture and cover with one thin layer of minced sliced carrots. Cover with other slice, trim the crusts and cut into fingers. - This amount of filling should be enough for about 3-4 large sandwiches which you cut into 3-4 fingers each depending on how wide the slices are (total of 6-8 slices of bread). To ½ cup of softened cream cheese add 1-2 Tbs. finely chopped mint. Spread both sides of thinly sliced bread with cream cheese mixture and cover with one layer of sliced radishes. Cover with other slice, trim the crusts and cut into triangles. - This amount of filling should be enough for about 3-4 large sandwiches which you cut into 4 triangles each (total of 6-8 slices of bread). Peel and thinly slice cucumbers, salt them and let drain for at 30 minutes; pat dry with a towel and set aside. To ½ cup of softener cream cheese add 2 Tbs. of finely minced watercress leaves. Spread both slices of bread with the cream cheese mixture. Cover with one layer of cucumber slices and other slice of bread, trim the crusts and cut into two-bite size triangles. We used whole wheat bread for this, but you can use white if you prefer. It must be a soft, moist bread otherwise the sandwiches are dry and hard to bite into. One loaf of bread can feed as many as 15 people given that there are other snacks to nibble on in your tea party! Inspired by our Charisma perfume, these charismatic truffles are made of smooth organic white chocolate, organic heavy cream flavoured with Japanese matcha powder, spearmint, jasmine, litsea cubeba and kewda hydrosol. Enjoy your Charisma Truffles with our matching Charisma Tea. They also go well with Morrocan Mint Tea, ceremonial Matcha green tea or even a glass of sake! ½ cup powdered coconut cream, mixed with 1-2 tsp. matcha green tea. b. Place in a Bain Marie over gently simmering or very hot water, and stir with a wire-whisk. c. Just before the chocolate is completely melted, remove from heat. d. Add the cream and the Matcha powder. Stir with a wire-whisk until the cream completely blends with the chocolate. e. Add the essential oils drop by drop, and stir with the wire whisk until completely blended. Don’t forget to taste in between to ensure you’re not adding too much or too little. Trust your taste buds! f. Cover with a plastic wrap right on top of the surface (to avoid condensation) and refrigerate until firm (usually takes 2 hours or more with white chocolate). j. Rinse the scoop in warm water in between truffles, to make it easier to release the chocolate from the scoop. k. Once all the truffles are made, shake the baking sheet to cover the truffles with the coconut and matcha mixture. l. Store in a sealed container and refrigerate until firm before serving. Me and the perfume display. Guests at the Blunda Perfume Lounge. Everything here is comfortable and smells good, naturally. - White Potion & Guilt chocolate truffles that Persephenie, Maribel and I rolled the day before. And there were even sakura branches from the nearby flowershop to decorate the table! I'm sniffing the Hanami scent-strip fan (my demo included a breakdown of the notes for hanami, divided into accords - i.e. metallic wood accord, Sakura accord, etc. - and the perfume's structure - i.e. base, heart & top. The Hanami banner is so big. Or maybe I'm just really tiny... It's all relative. 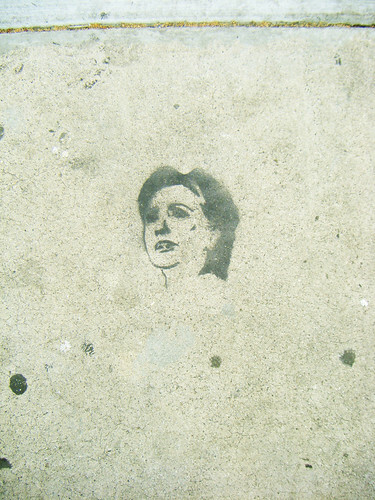 Hilary Clinton, originally uploaded by PurpleSpaceShip. "Unveiling a bold scent described by its manufacturer as "steely, bracing, and curt, with notes of patent leather, sandalwood, and wool serge," Secretary of State Hillary Clinton launched her own line of soaps, eaux de toilette, and body splashes Thursday". The scented white-out will be released shortly after. Via the Onion. Which means it's dead serious news. Through the Blunda Gate, originally uploaded by Ayala Moriel. 2) Aromatic Apothecary with many fantastic raw materials for sale - including incense making supplies, gums, resins, dried herbs and flowers, and, of course - essential oils of highest grades, including rare absolutes and Traditional Indian attars. 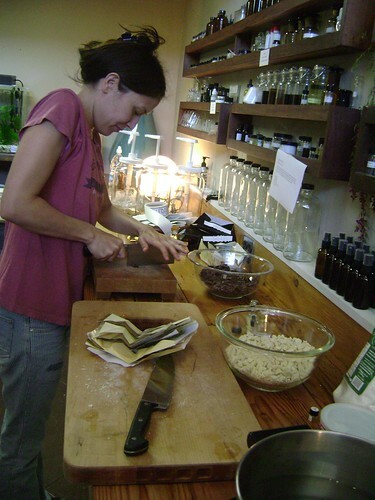 3) Interactive Studio - where you can take workshops for making just about anything that smells good: Persephenie teaches natural botanical perfumery, as well as guest teachers (Jeanne Rose is a regular guest). And other fun workshops, such as incense making, body products and skin care, candles, and more. 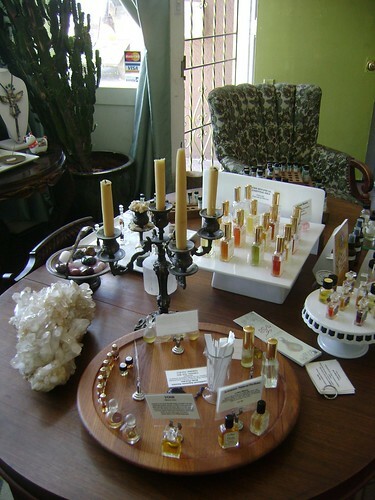 4) Perfume Studio where perfumer, artist and aromatherapist Persephenie Snyder creates her own perfumes and designs fragrances for candles and body products for other companies. Persephenie will launch her scented skincare line and her new perfumes in her very own Natural Botanical Perfume Exhibition No. 3 @ Blunda next month, May 30th. Dawn Spencer Hurwitz, the renown independent perfumer from Colorado who has several ntarual perfumes in her line (including her Perfumed Court line). Currently at Bounda there are two of her all-natural perfumes: Eau de Cologne (Aqua Admirabillis) and Rose Vert which are both very nice and simple. Dawn's exhibition at Blunda will be in October 24th. JoAnne Bassett's new lines - the French Collection and the Royal Collection - are naturally very French (JoAnne is from French background and lives in California). The line is complex yet very accessible and the fact that these are Eaux de Toilette sprays makes them easy to wear. I was especially smitten with Napoléon (a wonderfully made and long lasting spicy incense perfume), Madame de Pompadour (which is very unusual and sensual fruity-floral with notes of champaca, gardenia vanilla, verbena and clementine and I am quite sure I also smell cassis and a hint of patchouli in the mix), and Camille (sophisticated floral with osmanthus and tuberose) and Chantelle (floral and fruity with jasmine, rose and tuberose). The lines offer quite a versatile range. Josephine, for example, is a classic green rose and iris scent. JoAnne will be at Blunda for her exhibit August 15. Mostly the miniatures (except fo Pink Lotus the stunning Shiso), and including the new perfume Cassis, which I found to be too muddy and dominated by patchouli. Velvet & Sweet Pea's Purrfumery - From the perfumes, my favourite which I tried was Narcissus Poeticus, which smells more like Osmanthus than narcissus. And I was most smitten with the whipped frostings the Laurie creates, with whipped shea butter and soft florals. I took home with me a jar of both Kashmir Rose (smells like Rahat Loukoum) and Gardenia Tuberose (heavenly creamy tuberose with underlining coconut). Yosh's Winter Rose - a spicy rose in an oil base with notes of cardamom and Turkish rose. Yosh will appear at Blunda sometime in July (exact date TBA). And of course, there is my very own line, which I am very fortunate to have in this wonderful location and setting - with 5 newly added perfumes - Bon Zai, Charisma, White Potion & Zohar (in both 5ml roll-on oil formulation and 9ml flacons of Parfum Extrait which is grain alcohol based). And the new perfume, Hanami. Also new to the selection at Blunda are my 4 scented soywax candles (8oz each, which last for 60 hours) - ArbitRary, Bois d'Hiver, Roses et Chocolat and White Potion. These new products are not on the Blunda website as of yet, but if you live in LA or the area you can find them at the boutique. I will let you know when they are up online. Other treats at Blunda include candles, candle holders and diffusers (I really liked Persephenie's pretty and simple aromatherapy candles - particularly the Eucaliptus & Spearmint and the Lemongrass & Chamomile one - which was surprisingly very floral). And there are body and skincare products too - such as Velvet & Sweet Pea's bath salts and the abovementioned and incredibly beautiful whipped frostings; and Ayurvedic skincare, and of course - very soon Persephenie's very own line of scented skincare, of which I only smelled Vetiveria but will let you know once it comes out and I've tried every single one of them. As I write this, the sun is shining full-blast on a beautiful Vancouver morning. It seems I've done the impossible - pack some sun in my suitcase to Vancouver, even if just for a two days, the weather has been summer-like (i.e. : around 18c. I know, I know, this is ridiculous comparing to the heat wave of 32-34c that I experienced the beginning of the day I left Los Angeles - but in Vancouver terms, anything approaching room temperature is hot, and anything over 25c is sizzling hot!). But I was able to pack a couple other sunny things from California that got here fresher than the usual produce we get on the grocery counters in BC. Just around the corner from Blunda on 3rd street there are several good places to shop and eat. One of them is the Little Next Door on 8164 W 3rd St Los Angeles, CA 90048, United States - (323) 951-1010 (Open Mon-Thu,Sun 6pm-10:30pm; Fri-Sat 6pm-11:30pm). Just across from it on the sidewalk grows an olive tree. This is a French deli-café that concocts her own preserves, jams and fabulous desserts. The salad and breakfast menus are to die for. I came back with the Meyer Lemon Marmalade below (spiked with cinnamon, coriander and vanilla) which almost tastes like yuzu! I also got this seemingly mouthwatering Earl Gray Tea flavoured dark chocolate for a mere $10 USD only to find out that it hardly tastes like Early Gray Tea AND it can be found for an even merer $7.25 or so (probably plus taxes) at Urban Fair. The conclusion: Dolphin Chocolate's Earl Gray chocolate squares are still the best. I can only wish that Urban Fair will bring them as they do exist! This one does look quite impressive though, don't you think? And last but not least - a dessert worth trying: a sandwich made of two strawberry macaroons with fresh halved strawberries in the middle and, of course, whipped cream! The selection of incense at Blunda is extraordinary, and includes Indian incense, house blend of loose incense similar to Egyptian Khyphi but blended with Native Indian herbs and resins, Koh-Doh tools and accessories (and pretty porcelain incense holders as in the picture above); and high quality Japanese incense from Shoyeido. I was particularly smitten with the Chai and Frankincense sticks from their Gourmet collection. There is also a plum blossom incense for heating on the mica plate (rather than burning directly on charcoal). These pretty incense pellets are fashioned in the shape of pink plum blossoms and arranged as if to decorate a fan! The Chai incense is milky and warm like a Cashmere sweater. I haven't burnt the Frankincense yet but it smells like a Japanese take on church incense. The coil in the photo above is Shoyeido Nijo coiled incense (Avenue of the Villa). It smells more traditional Japanese with camphor and agarwood. The store design is a minimalist interpretation of new age. The crystal bottles are displayed among hollowed crystal rocks and on chunks of tree roots. A long glass displaly table greeted us at the front, and behind it, manning the desk was a lady intently reading book about plants and hiding behind it shyly for a while, allowing us both to sniff our way without much disruption. Deeper into the shop, lines of organic body care from other brands (i.e. : John Masters and In Fiore’s boday balms), and baskets with sachets of Douglas fir needls caught my nose the most. Further in, there is a little capsule which looks like a glass train compartment of two benches in front of one another. This is where Alexandra Ballahoutis conducts her custom perfumes, where the client gets to taste different floral waters and apply different essences on their skin. Up until recently, the entire line was only made into the pure parfum concentrnation. I tried a few (Trapeze, Fair Verona, Pearl Dragon) and found them to be dense, medicinal and even muddy – in short, quite unaccessible. Recently, most of the perfumes were made into an Eau de Parfum formulation (contrary to the website, as far as I could tell the entire line is available in the new Eau de Parfum concentration). Creamy gardenia, not overly heady. Tropical and rich. Will have to write more about it later after I try the sample on my skin. I also learned that Lady Day, which I always wanted to try is no longer made since the launch of Epic Gardenia. If anyone has an idea of how the two compare I would love to hear more about it. From the new trio of modern, natural soliflores this one intrigued me the most. The intention behind it is to “FOLLOWS THESE FLOWERS BENEATH THE GARDEN FLOOR AND REVEALS THAT SWEETNESS BELIES STRENGTH”. It does not smell like lily of the valley on the blotter paper, but it does have an impressive lily of the valley suggestion on the skin – only richer and more complex. A narcissus note amplified as it progressed on the skin through the heart note phase. I will post a full review of that shortly as I received a sample at the boutique. There was something intriguing about this perfume, and I wish I could wear it to follow its evolution. It has blue lotus and high quality aged patchouli as a base, which reminds me of Pashmina scarves. The most intriguing of them all, with its interplay of mystery and familiarity. It is subtly floral at first and mostly musky in the dry down, warm with hints of spice. Much headier than the Epic Gardenia. The dry down is sultry, honeyed and sweet with hints of orange blossom. I have tried this before from a sample at home (the EDP I believe) and it’s a beautiful leathery musk, that reminds me very much of my Espionage only much lighter. This one, unfortunately, smelled completely vile to me, with its harsh greenness at first. I am partial towards green smells, so take what I say with a grain of healthy doubt. It was so omnipotent though that I wasn’t able to not mention it here. It's not the kind of fragrance that can go unnoticed in the first few minutes at least. I think it was also the first one to be published as an EDP in the line. A pretty rose. Haven't kept the scent strip but ordered a sample too (you can only order samples online, which makes sense - at the store you can try them than and there). Unusual and mesmerizing although I’m not sure it’s for me. Tannin and leathery with its black tea notes but also lighter than might be expected with hints of florals and mint. It strikes me as one of the scents you absolutely cannot form an opinion about unless you’ve tried it on your skin. So I just ordered a sample online now. Hanami Perfume Launch @ Blunda Natural Botanical Perfume Exhibition #2, originally uploaded by Ayala Moriel. White Potion - creamy and dreamy tuberose soliflore, with milky sandalwood and tonka bean base - also available in matching candle! Zohar - sunny and lively orange blossom soliflore encompassing the scent of orange groves in full bloom just about now - when there are still overripe oranges hanging on the branches! These come as an addition to the selection at Blunda in the past 2 years - Espionage, Tamya, Finjan & Palas Atena which were offered only in the oil base flacon, but will now be available also in 9ml parfum extrait (alcohol base), and 5ml roll-on bottles. The exhibition at Blunda was great, meeting lots of passionate perfume people. The following posts are mostly photos as I'm too tired to write and need to do a lot tomorrow before flying back to Vancouver. I have a feeling this is not going to be my last time in California though - this place rocks! The people, the food, the sun, the perfumes - it really feels like the centre of it all. I hope the rest of the series will be very successful for Blunda and the other perfumers. In the presentation, I spoke about the creative as well as technical process of creating Hanami. Selecting the notes - wet woody notes for the base, and the sakura accord for the heart. Using scent strips, I demonstrated how each notes stands out on its own with its unique characteristics. And than showed how they combined together to create Hanami. I also talked about the inspiration, and how I finally arrived at selecting the name. 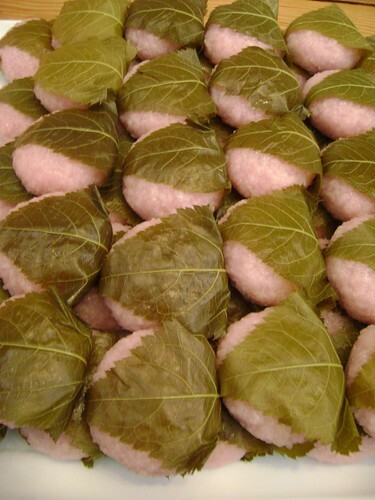 Sakura Mochi, originally uploaded by Ayala Moriel. Hanami Flower Arrangements, originally uploaded by Ayala Moriel. We served all three perfume teas (Charisma, Roses et Chocolat & Immortelle l'Amour) and afternoon tea treats, including Sakura Mochi, perfumed chocolate truffles and fresh tea sandwiches the Maribel & I made that morning - cucumber & watercress, minted radishes and carrot-ginger (all with cream cheese). The Truffles!, originally uploaded by Ayala Moriel. 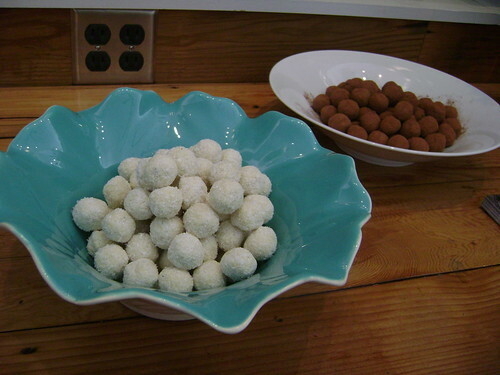 We made 2 perfumed chocolate truffles - White Potion and Guilt. White Potion really complements the sakura accord in Hanami as it was made with both magnolia and tuberose. The almond essence kind of mimics the coumarin notes of tonka (which is really not good for consumption use). Andre', Persephenie's husband and business parter, who took photos of the event (I'm sure his turned better than mine - look at that camera!). Andre', originally uploaded by Ayala Moriel. Persephenie talking to a guest at the exhibition. 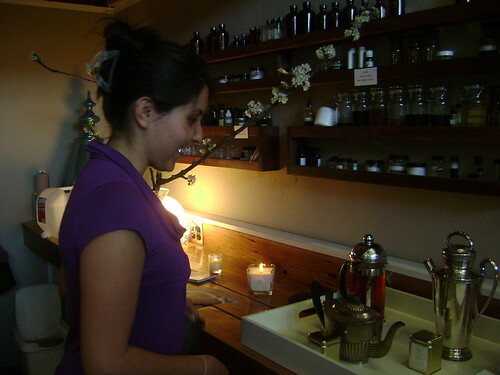 In the background is her incredible collection of natural essences - a perfumer's organ arranged on the shelves. Persephenie & Janet, originally uploaded by Ayala Moriel. Maribel, Persephenie's assistant who was more helpful than I can even begin to tell. And very sweet too! Maribel, originally uploaded by Ayala Moriel. Maribel helping Janna at the perfume lounge area in the store front. Janna & Maribel, originally uploaded by Ayala Moriel. 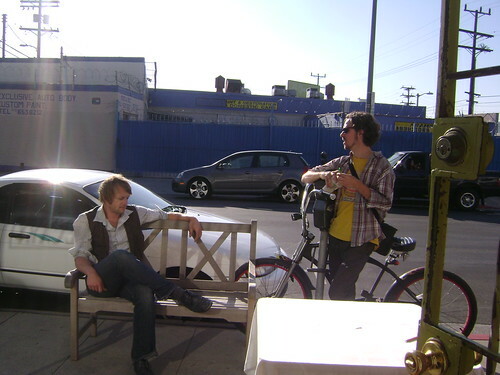 Outside Blunda - Andre' & Friend, originally uploaded by Ayala Moriel. Sniffing away..., originally uploaded by Ayala Moriel. 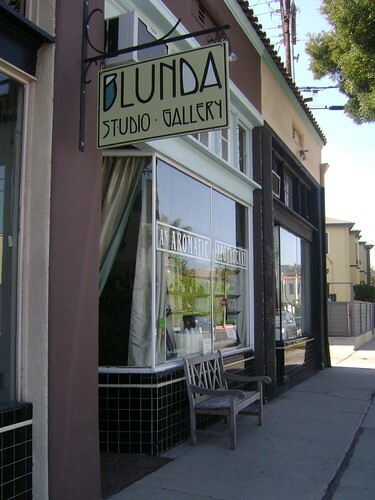 Blunda Los Angeles, originally uploaded by Ayala Moriel. View of the Boutique @ Blunda, originally uploaded by Ayala Moriel. Blunda means to close one's eyes in Swedish. This family owned studio boutuqie is beautiful, intimate, comfortable, cozy and home-like and at the same time feels like a temple or a shrine. 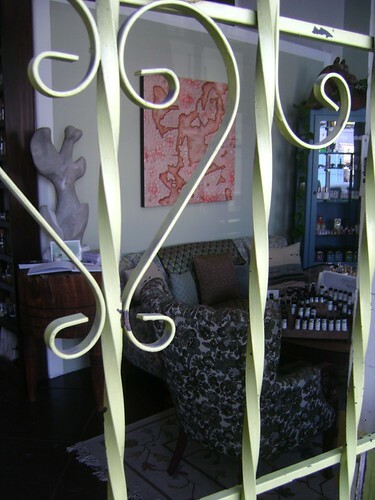 A place of refuge from the hectic pace of modern life where one can relax, enjoy fragrance in an unhurried, unrushed manner while getting to know the founder - perfumer and teacher Persephenie Snyder. 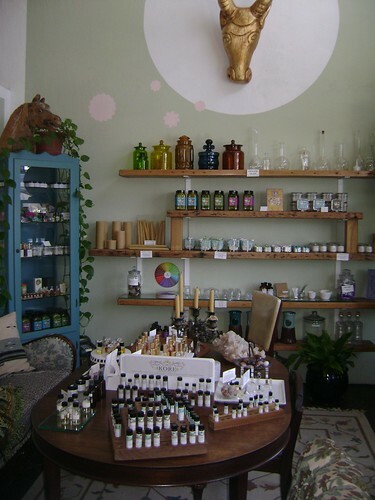 Incense, natural perfumes, botanical essences and aromatic herbs, roots and resins from around the wolrd are encompassed in one small and sweet space on Edinburgh & 3rd Street in Los Angeles. Below are more photos to give you a sense of what the space is like. Natural Perfumes @ Blunda, originally uploaded by Ayala Moriel. 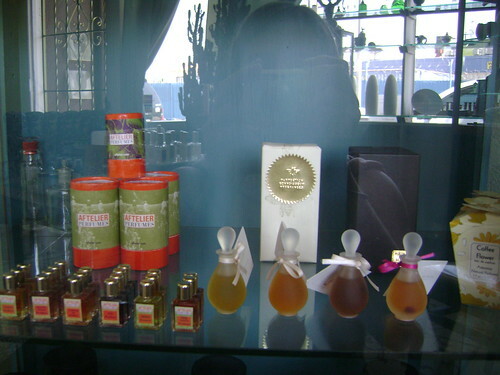 Closer look at the Ayala Moriel perfume collection offered at Blunda: Tamya, Espionage, Palas Atena and Finjan. This weeked we'll offer a few more: Bon Zai, Charisma, White Potion and Zohar. And of course - the star of the show: Hanami. 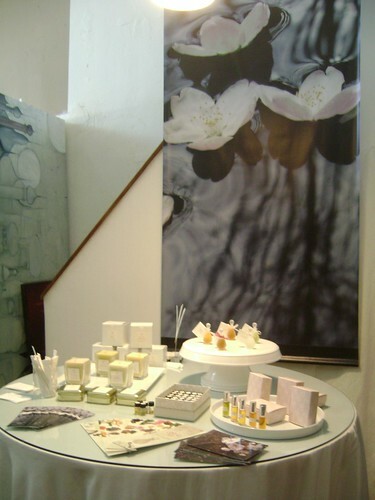 Natural Perfume Lounge @ Blunda, originally uploaded by Ayala Moriel. The spinning tray with natural perfume lines. 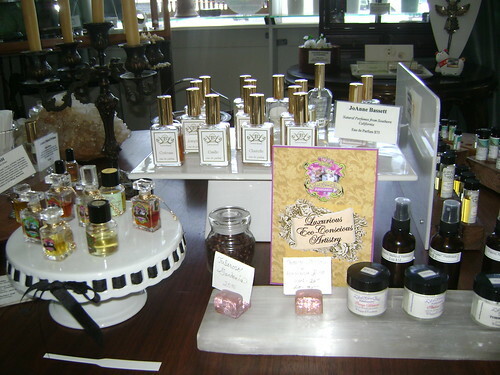 In the middle of the table are JoAnne Bassett's perfumes, which are very French and classy - and all natural. My favourites include Napoleon (incensey and rich with frankincense and myrrh; lovers of George Sand will love it) and Madame Pompadour (from the Royal Collection); and Camille and Chantelle (from the French Collection). Laurie Stern's perfumes are luxurious and complex. Her concoctions include a line of candles and body care products. The whipped body butters in Tuberose & Gardenia and Kashmir Rose are to die for. I'll be leaving with these in my suitcase, for sure. Making Truffles, originally uploaded by Ayala Moriel. Persephenie chopping up the good stuff for chocolate truffles (Valrhona's 71% cocoa). These form the base for my deadly Guilt chocolate truffles to be served to the guests tomorrow. The white chocolate is for White Potion truffles with a hint of magnolia added, to make them suit the scent profile of Hanami (which includes tuberose, magnolia and tonka bean to name a few notes). We'll also serve Sakura Mochi - Japanese rice pastries filled with Azuki bean paste and wrapped in pickled cherry leaf - a seasonal specialty of the Hanami festival, and minted cucumber tea sandwiches to go with the Charisma afternoon tea! At 2:30pm I will be speaking about the inspiration of Hanami and demonstrate how the perfume was constructed with the various woody and floral notes and the sakura accord. 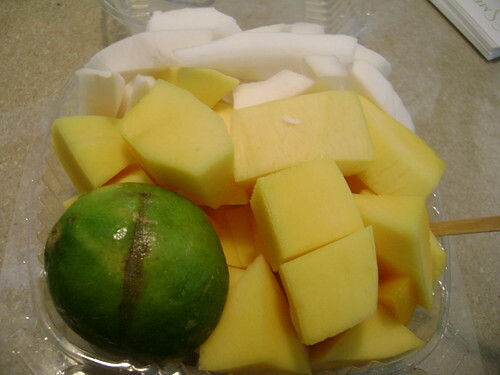 Mango, Coconut, Lime, originally uploaded by Ayala Moriel. The abundance of fresh fruit in California is overwhelming. If it wasn't for the noise and the traffic I'll be certain I'm in paradise. A Mexican lady goes from door to door everyday selling these amazingly fresh fruit and roasted nuts. This is usually eaten with the lime squeezed on top and sprinkled with dry red chile pepper flakes. I skipped the chile - just had a green papaya salad with a spicy chile and lime dressing the other day so wanted to enjoy the fruit on its own this time around. Jean-Claude Elena speaks of memorable olfactory moments and gives us a glimpse into his original pairing of unusual and sometimes mundane notes. 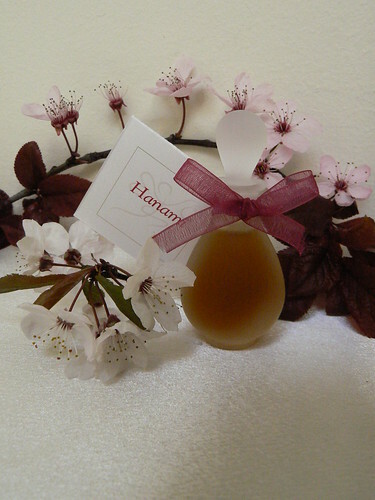 Hanami Perfume, originally uploaded by Ayala Moriel. 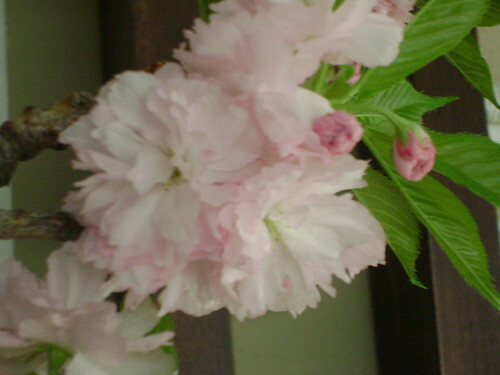 Visit the ScentHive to read Trish's review of Hanami. And for those of you in Los Angeles area, I'm inviting you here again to join me for afternoon tea, perfume sniffing and discussion at Blunda this Saturday, April 18th, 1-5pm. Click here to reserve your spot - spaces are limited and there are only a few more spots available! 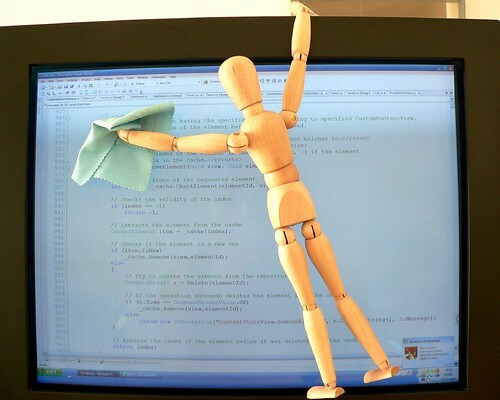 Code washing, originally uploaded by Ezu. Internet dating might finally become the perfect way to choose a mate thanks to a new fast saliva test "to determine your own body odour and enter it as a code in a database. If the flirt partner has also entered their smell profile, you can find out within seconds whether you would like their smell". All you need is to lick a piece of chromatographic paper and a whole new world of smelligible singles will be at your finger tips (if they've taken the test too, that is). The company who developed the test, called Basisnote hopes to implement it in internet dating. In addition to your hobbies, photos and physical specs, you could soon enter your body odour code and search for compatible mates. Ad - Armani Code - Modern Flapper, originally uploaded by George Morris. The theory behind this test originates in a 90's study by Claus Wedekind at University of Bern. According to Wedekind, we choose mates based on their body odour, which is affected by the person's immune system. The greater the difference in the immunie system, the better the chances of having healthy offsprings with that person. Better figure this out before wasting your time and money on another first date with the wrong smelling person and having unhealthy baby with them 9 months later. Rather than starting a new dating site, Basisnote ((I wonder if Basenotes are going to sue them?!) next step is to delve into the fragrance industry. Armani Code might take a whole new meaning. Growing with 4 younger brothers, I know all too well what this article is all about! Madonna Lily, originally uploaded by Ayala Moriel. Happy Easter to all who celebrates! White flowers symbolize purity in both Christianity and Judaism. The term “lily” as mentioned in the Old Testament, however, is obscure and it is still unclear which botanical species is referred to in the scriptures. The two names in question are “Chavaztelet” and “Shoshana”. The latter is often confused with rose by native Hebrew speakers and Bible translators. The correct name for rose in modern Hebrew is “Vered”. Both chavatzelet and Shoshana are most likely reference to bulbous flowering plants, and there are many ideas of what species it refers to. If indeed it is shapely white flowers – the possibilities could include narcissus or beach lilies - both very fragrant. Other possibilities include Netz Halav or wild hyacinths, which are blue and not particularly fragrant either. Although “lily of the valley” is mentioned in Canticles, it can be said with absolute certainty that this is not Convallaria majalis, a European plant that could not have possibly survived the dry conditions in the land of Israel. Both the European Lily of the Valley and the Madonna Lily (Lilium candidum, native to the Balkans and West Asia), have developed into the Christian symbol of purity and chastity and is associated with Virgin Mary. 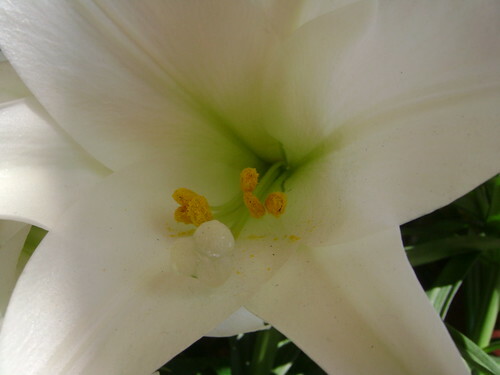 Easter Lily (Lilium longiflorum) is similar in shape and scent to the Madonna Lily only larger, and is native to Japan. Fresh , slightly watery lilies with cantaloupe and vanilla. Easter lilies in full bloom, with pronounced orange blossom. Awaken the goddess within yourself (Anais was a Persian goddess) with this classy green floral with fruity and clean soapy notes. Indulge in a big gourmand lily with chocolate and patchouli. Lily notes seem to be having some kind of a vogue recently, as we can see form recent releases of other mass produced designer fragrances (Donna Karen Gold, Guess Gold, and Juicy Couture’s fruity-floral candied gourmand take on lily) as well as celebrity fragrances (i.e. : L – L.A.M.B. by Gwen Stephanie, in a similar manner to Juicy Couture but a little more watery). 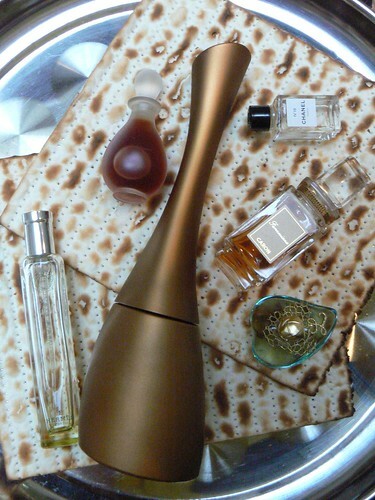 Forbidden Passover Perfumes, originally uploaded by Ayala Moriel. Craving leavened bread and pastries this Passover? You may want to try these starchy, pastry-like perfumes. Or, alternatively, avoid them altogether. Some particularly zealous Jews even go as far as not using any toiletries made with grain alcohol (if you don’t eat corn and legumes during the holiday). I’ll leave it up to you whether you use these perfumes to cope with the inert Middle Easter craving for freshly baked bread; or choose to use this list to decide what to clear off your shelves. But these are the starchy, pastry-like perfumes I found in my collection and after the customary soul-searching for leaven prior to the Passover. My list is divided into three categories, by the degree of danger it may theoretically pose to those observing Passover: the dangerously non-kosher for Passover, containing wheat products; scents with unknown kosherism level that have a very clear pastry or starch-like qualities; and finally – gluten-free, rice-smelling concoctions. Feel free to add to the list as I’d love to hear of more scents from either categories. These are dangerously non-kosher for Passover, which actually contain wheat absolute. This light cucumbery lilac is reminiscent of the first sprouts of wheat and actually contains wheat absolute. Could be the equivalent of a Hendricks gin in the land of lilac. But honestly, with this name - could there possibly be a more appropriate perfume for this holiday?! These cinnamon waffles are made with wheat absolute, maple syrup and orange. Delicious but definitely will not pass for a Passover brunch! This liquid version of violet macaroons is creamy and marzipan-like and as far as I can tell has all the baked goods qualities sans the wheat. Starchy raw root aroma, reminiscent of a semolina dessert. With an un-identified cereal note, this vetiver is as warm as roasted nuts with a hint of caramel. Another starchy concoction, which is what I would imagine the “bread fruit” to smell like. Basmati rice gives champaca absolute the royal treatment it deserves. Milky rice with frangipani and an almondy cherry note. 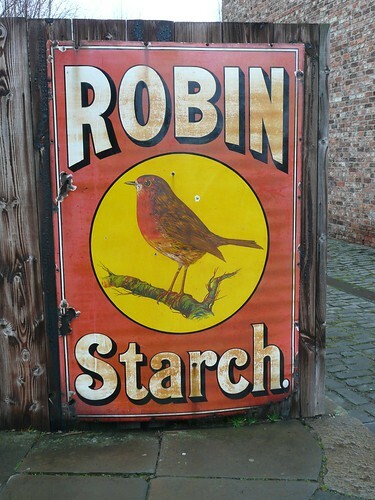 "Robin" Starch Advert, originally uploaded by Motorman Tel.